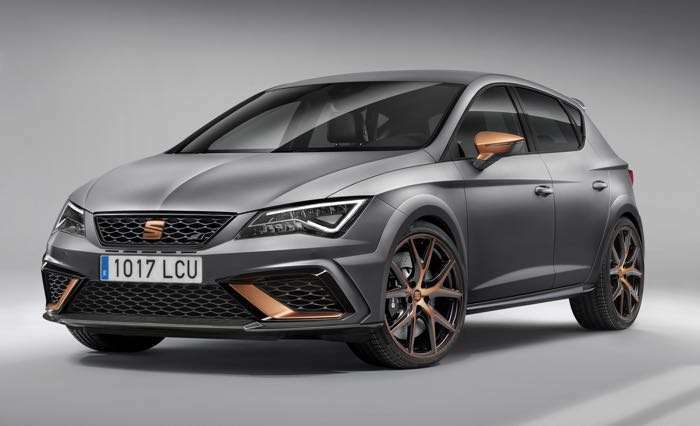 Seat has announced a new version of its Seat Leon Cupra R and the car maker has said that this is their most powerful Leon to date. The new Seat Leon Cupra R will make its debut at the Frankfurt Motor Show later this month and it comes with a 2.0 litre turbo petrol engine that develops 306 horsepower. The new SEAT Leon CUPRA R will undoubtedly capture show visitor attention on the Spanish brand’s stand at the IAA 2017. SEAT’s most powerful road car in history will also be its most exclusive, owing to the fact that it will be limited to 799 units. The new SEAT Leon CUPRA R will be available with manual gearbox (310 PS) and DSG (300 PS), with six speeds and front wheel drive. There are some stand-out details on the bodywork such as exclusive carbon fibre details on the front and rear spoilers, side skirts and rear diffuser, wing mirrors in copper, as well as the rims, with the wheel arches and the front area getting a new, more powerful design around the air intakes. You can find out more details about the new Seat Leon Cupra R over at Seat at the link below, we will have more details about the car later this month.